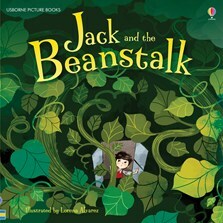 The classic English fairytale, specially rewritten for young children and brought to life with stunning illustrations. Jack and his mother are so poor that they don't have anything to eat. Their hope is fading, until Jack meets a strange little man with a handful of magic beans... What happens next changes Jack’s life forever. The simple text and vibrant illustrations will appeal to very young children at story time and to older children just beginning to read alone.